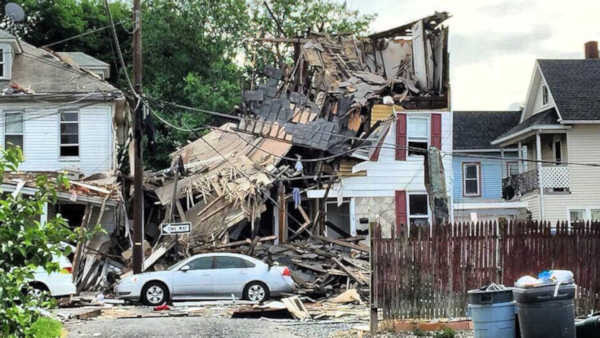 PHILLIPSBURG, New Jersey (WABC) -- Two people were injured, one severely after a house exploded in Phillipsburg, New Jersey Saturday. The explosion happened shortly after 5 p.m. at a duplex on 75 Filmore Street. One of the victims went to Cedarcrest Hospital with severe burns over 50 percent of his body. The second victim had just a scratch on his face. There were two people inside the duplex when the explosion occurred. Many surrounding houses were damaged, and had their windows blown out. Officials do not yet know the the cause of the explosion. Mayor Stephen Ellis says authorities smelled gas in the area. The Red Cross says it's assisting nine people in three families who were displaced by the blast.